I suppose we were due a break and fancied two or three days walking somewhere different so after a bit searching on tinternet we were drawn the Yorkshire Dales. The Morritt Hotel was within budget for three nights being spoilt a bit. Very nice room with a four poster bed and a spa next door to the hotel which used to be the petrol station before the bypass which now left the establishment in a quiet little area away from the heavy traffic. The following morning we had a hearty breakfast then togged up for a good walk to Barnard Castle and back. Fairly straight forward following the river after crossing the bypass. 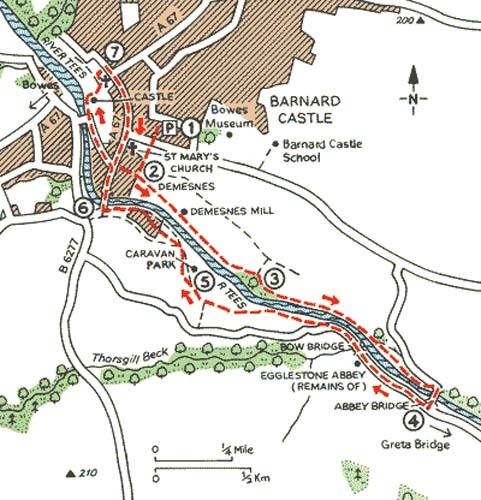 It was about five miles to Barnard castle town where we had a welcome hot choc and a slice of cake on a very very comfy setee and which was very very hard to get out of. We couldn’t pass up on the chance to go in the Bowes museum and had a guided tour which was very interesting and the silver automated swan picking the fish up in a glass case accompanied by music was magical. Time to head back a slightly different way across the fields but came to the same Abbey bridge that we had crossed over that morning. Now it bothers Julie more than me to walk the same route over again especially on the same day so not really sure where the next crossing would be we took a chance and stayed on the same side of the river hoping to come across a bridge soon as we had already done about nine or ten miles. There was a meeting of rivers which we worked out was virtually in line with our Hotel and it was suggested crossing it somehow!....No bloody way! It was too fast and too furious! Another couple of walkers informed us that we should have crossed at Abbey bridge and the next one was Whorlton. Pretty tired now but it was a lovely sunny evening and eventually found the bridge which was worth seeing as it goes, a narrow suspension bridge first of its kind in the country supported by the original chains ( it did move about quite a lot when a car drove past which kept us in suspense). Hotel in sight, probably about 15 miles altogether but well worth it.